Today for dinner I decided to make some chicken wrapped in matza, dipped in egg and then fried. I served this with sautéed Mushrooms and Spinach (my old standby). In theory, what you’re supposed to do is ‘moisten’ the matza with a little water and let it sit while you’re sautéing some onions and ground chicken. Then you add in a little matza meal and some eggs, then roll the chicken mix up like a rollatini in the softened matza. THIS is where I need to mention that I used 4 chicken breasts cut into chunks, not ground chicken, right? I ended up having too much chicken for the recipe and made it all crispified in the skillet after the rollatini were cooked. 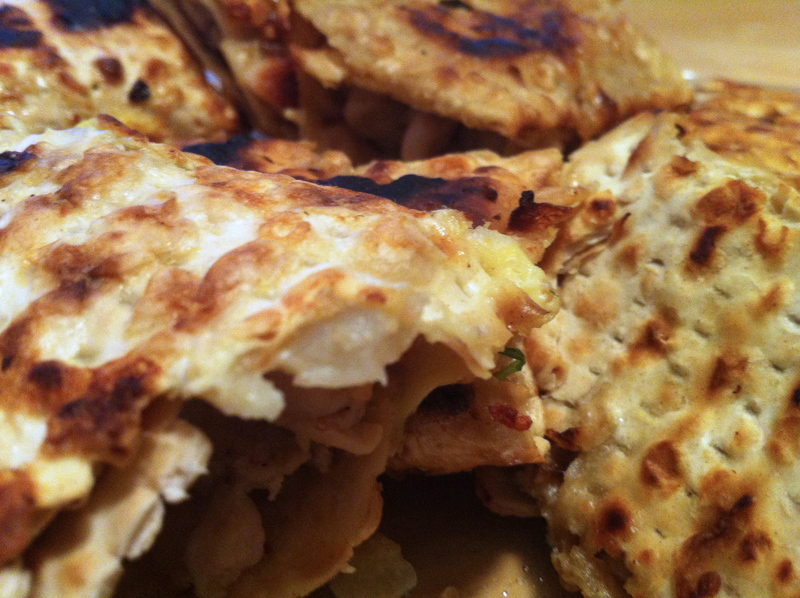 1 1/2 cup Ground Cooked Chicken **I used 4 Chicken Breasts cut into small chunks. You know something, ground chicken would’ve held together better. Ahh well. Live in learn. 1- Sprinkle Matza with water and wrap them in a damp towel. Let stand for 10 minutes. 2- Chop the onion and sauté in the oil until golden. Add the chicken and cook for 10 minutes. Remove from the heat. **Since I was using breasts instead of ground, it took a little longer to cook the chicken through. 3- Add two eggs and the matza meal and season to taste with salt and pepper **I added in a bit of Garlic Powder too, as I found this mix a little bland. 4- Cut each matza in half. Near the narrow edge of each half, put a tablespoon of the chicken mixture and roll up the matza carefully. 5- Dip each roll in the remaining beaten egg **I added a little water to stretch it out a bit. Fry the rolls in hot oil until golden brown on all sides. 6- If you have extra chicken, feel free to add a little more oil to the pan and dump in the extra chicken. It gets all crispy and browned and DEEEE-licious! It was this chicken that little R ate and ate and ate. 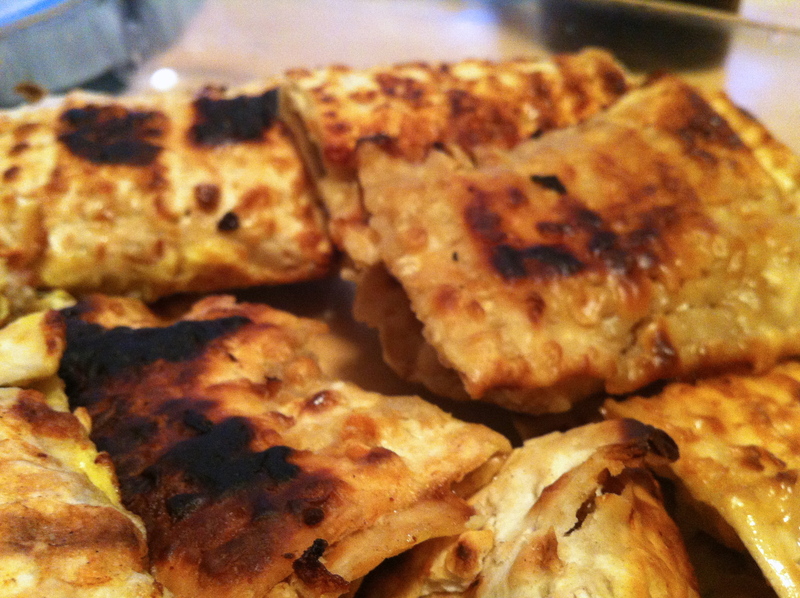 End Result: Even though they were a little oily, these chicken roll-ups/rollatini/turnovers were delicious. J ate a BUNCH and R ate sooooo much of the filling. C said he can’t remember R ever eating so much chicken before! I compensated for the shame of my scab falling off mid-meal by drinking a lot of wine. J ate an ENTIRE rollatini and R ate the equivalent of 3/4 of a breast of chicken!